Every year I write a letter to my seniors. Each year the message is pretty much the same, though the way I deliver it may change a bit based on the class and what I’m feeling at the time. Each year I hate my letter when I’m done, but I decide I’m going to give it out because it’s a tradition and I don’t want to break it, and I convince myself it is not that awful. I hand it out. I’m grateful after I do, because… I suppose I need closure. I have worked with these kids closely for a year (sometimes more). And I have come to care about them all. And although it happens every year — they leave and I stay — and from this point on they slowly begin fading from my memory, right now they are in my life in saturated colors and I know I’m going to miss them and I want the best for them. So even though I currently hate it, here is this year’s senior letter. 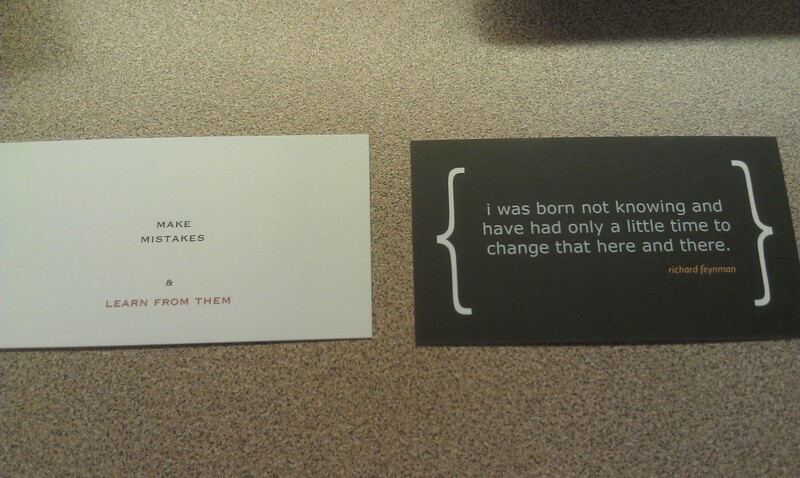 It came packaged with their “who I am” sheet that they wrote about themselves on the first day of class, and two cards I had printed. I love the Feynman card! Any way I can get the design? i just made them on vistaprint!